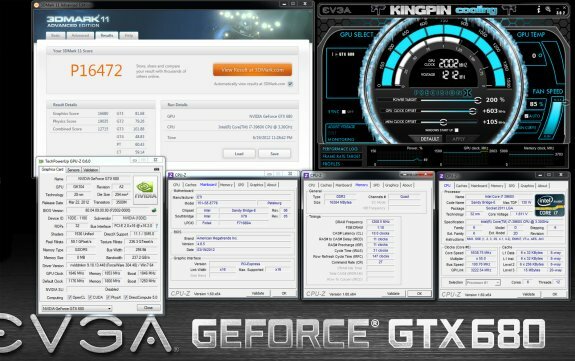 k|ngp|n and EVGA achieved a new overclocking record by pushing an EVGA GeForce GTX 680 Classified graphics card to a GPU clockspeed of 2002MHz! When NVIDIA launched the GeForce GTX 680 in March of this year, we saw a company moving away from "hot clocks" and reduced the overall clock to just a bit above 1GHz. Soon after, we started seeing various overclocks, but we did not witness the 100% overclock - even when liquid nitrogen was used. Vice k|ngp|n Lucido, EVGA's resident overclocker had other plans. By working closely with the engineering team, they created a GTX 680 Classified - a custom version of the NVIDIA GeForce GTX 680 card.